Hello everyone! At the beginning of December I told myself that I wanted to be under 200 by my birthday, January 27. I didn’t quite get there but I was so happy with how I looked and that’s what matters! I’m down to 202 pounds, meaning I’ve lost 115 in 6 months. A lot of people had been asking me where I got my dresses. I order most of my clothes online, which can be risky, but I find it often pays off. It’s hard to find clothes as a plus-sized woman, especially dresses. I won’t wear anything that doesn’t have long sleeves, thanks to all of my sagging skin from losing weight. I had to get a little creative this year because I wanted dresses that were absolutely fabulous. I ordered around 8 (just to be safe) and decided to wear two. The first was an unreal sequin number from Kami Shade based in Los Angeles. The quality of this dress was AMAZING. I’m going to put in another order with them soon, especially considering March is charity gala season! The second was a tight bodycon dress from Love Culture. It was an unbelievable $35! Once again, great quality. I have ordered one other dress from them and cannot wait to wear it. If anyone is ever interested in something I’m wearing and wants to purchase it, let me know. I only get photographed in something once so if I post it, it’s up for sale! Make your offer. The picture below is from my birthday last year. What a difference, you can now see that I have a shape. 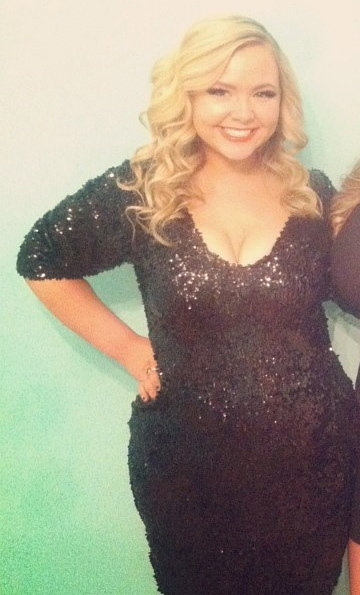 Can you tell that I love sequins? 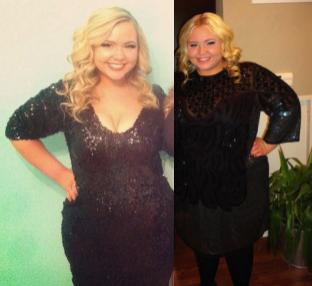 Tags: 100 pound weight loss, asos curve dress, bariatric, bariatric surgery, bariatric surgery and weight loss, before and after 100 pound weight loss, before and after gastric bypass, fashion, fashion after weight loss, gastric bypass, gastric bypass recipes, gastric bypass surgery, kami shade, kami shade review, kami shade sequin dress, love culture, love culture plus size dress, love culture review, plus size fashion, plus size sequin dress, rny, transformation tuesday, transformation tuesday 100 pounds, weight loss, weight loss surgery, wls. Bookmark the permalink. You look amazing. You are beautiful. Congratulations. Not only do you have a shape, you have a BANGIN’ shape! You look beautiful, Hilary! You can see it in your smile too – you seem so much more “at home” in your own body – I’m sure that is an awesome feeling and you deserve it! I’m so happy for you to see your hard work paying off! Thank you Lauren! It’s weird, I thought I was decently happy before, and I smiled often, but now my smile is so much different! It’s something I had never noticed but multiple people have pointed it out now. I guess this is what real happiness is! Love this post! Gorgeous from head to toe love! So happy for your progress, you were beautiful to start with and grow more beautiful with each new picture. You have happiness written all over your face….Congrats !!!! You look absolutely amazing!!! 🙂 And I just love your style!